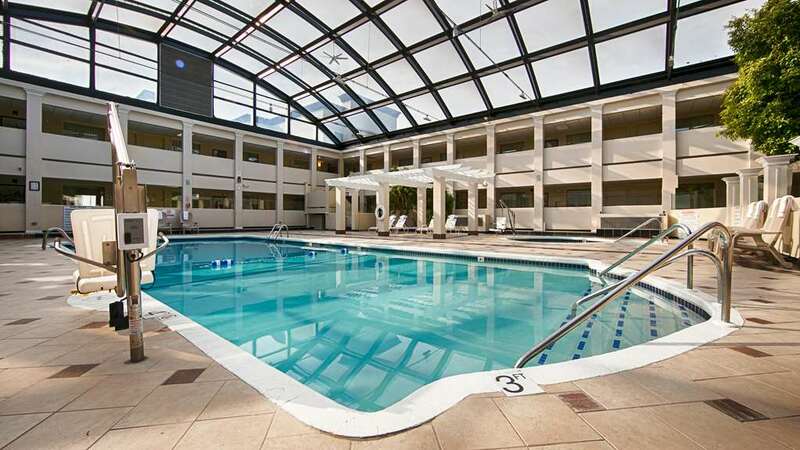 The Best Western Plus Milwaukee Airport Hotel and Conference Center is the premier full-service Hotel at General Mitchell International Airport. Our newly renovated, award-winning hotel has been renovated inside and out featuring the Aviator Sports Bar & Grille and over 13,000 square feet of glamorous convention space. Free hot breakfast buffet is served daily from 6:00 a.m. to 10:00 a.m., free 50 MB Wi-Fi, spacious atrium pool and hot tub area, and superior guest service just to name a few of our wonderful amenities. If you are staying with us for a meeting, banquet, flying out of our fine Hotel on vacation or just getting away for an evening, our impeccable service will keep you coming back again and again. We are only minutes from down town Milwaukee attractions, Miller Park and the Harley Davidson Museum. We will exceed your expectations. Aviator Bar & Grill: Aviator Bar & Grill, on premises, full service, American, open for: breakfast, lunch, dinner, A full service Sports Bar and Grill with daily specials a full menu to please any palette. From: north, south & west. Take Exit 318 off I-94 to Howell Avenue. Go left two blocks to Edgerton Avenue, turn left, the Best Western Plus Milwaukee Airport Hotel & Conference Ctr. is on the left.